DIY: 5 Easy Gift Wrap Upgrades | Evermore Paper Co.
1. Cotton ribbon (Above): This year I am swapping out my standard curling ribbon for cotton ribbon. The cotton goes much better with my natural theme and I love how such a simple switch gives each gift a more high-quality, store-wrapped look. 2. Hand-lettered gift tags: I've always loved making homemade gift tags and think that it shows that you put some extra thought into your wrap. Here's a great tutorial that demonstrates how to fake the calligraphy look. I also like the idea of using only the recipient's first initial. 3. Natural elements: I had some extra pinecones lying around and love how they tie in with my theme perfectly. I also plan on snipping some cedar and pine branches for additional freshness. 4. Shredded paper filler: I've started replacing tissue paper with shredded paper and think that it makes the presentation look much prettier. Like the ribbon, this is another simple upgrade that gives your gift a more professional touch. 5. 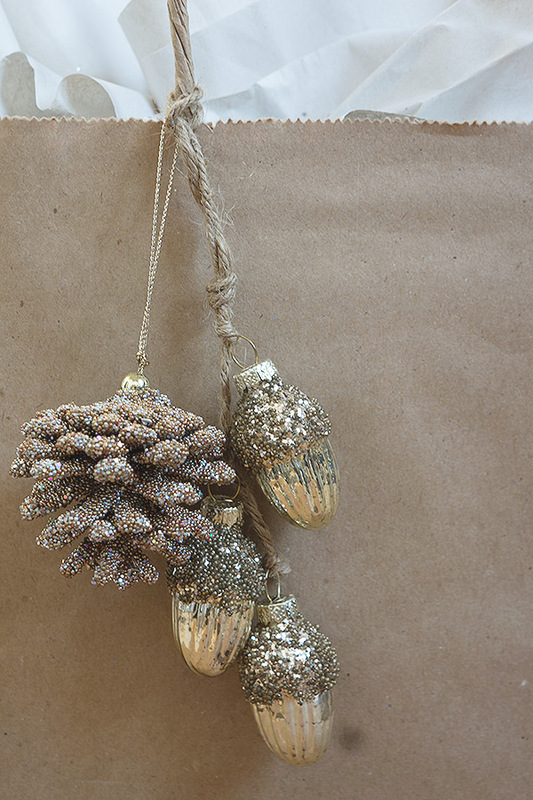 Ornament embellishments: I try to avoid using bags around the holidays but sometimes there's just no better option, or I'm simply short on time. When that's the case, I like to tie an ornament or two for some added bling and as an extra gift. It's an easy improvement that works great for wine bottles too!